The Valentine Heart is a classic, yet elegantly beautiful way to shower your sweetheart with love and affection for this coming Valentine's Day! Arriving in a heart-shaped box, covered with a crimson colored fabric and accented with a red satin ribbon tied to shape a rose pattern, are Godiva's signature assortment of Belgian chocolates. 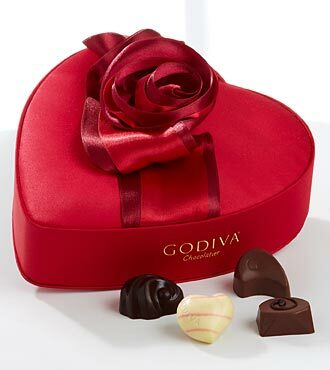 Godiva is known for their exquisite rich, velvety chocolate with fascinating flavors and intriguing textures, making this gift one that creates the perfect mood for romance. Delivery is made by courier service such as FedEx / UPS. Unfortunately neither service accepts requests for delivery at a specific time of the day. During popular occasions deliveries may be made as late as 9 p.m.